Considering that it's in the 20s today, with a light dusting of snow, it seems kind of silly to talk about parks. I can't help it, though. I've had this notion tumbling around in my head for weeks now, and if I don't get it out it will just continue to drive me crazy. 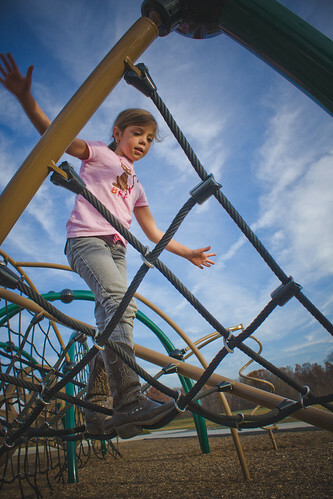 No prescribed entry points or exits to flex kids' mental and physical muscles. Climbing cables to stretch the imagination along while building upper body and core strength. Endless configurations available to allow kids to flex their problem-solving skills along with their muscles. 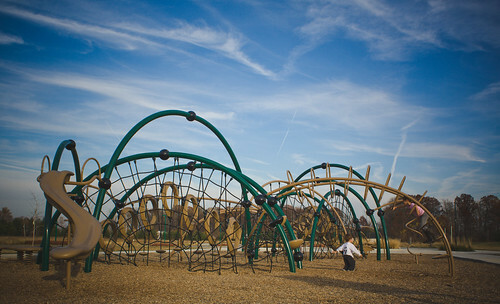 30% reduced carbon footprint compared to traditional play structures. I was intrigued, and so one day we checked it out. The kids were beyond excited about this new playground. They'd never seen anything like it before, and neither had I. We spent over an hour there that day, and we've been back several times already. Yesterday, when it was bitterly cold and snowing, they begged me to take them back to this park. And that's how I know this kind of park is really different, really cool, and something other parks and recreation departments should take into consideration when planning. You see, my kids don't really like parks. Maybe this has happened to you: you take your kids to the playground. It doesn't matter which playground, because there are really only 3 or 4 variations on the same tiresome playground around town. Don't get me wrong, the playgrounds are all really nice, freshly mulched and very safe. They're all those things plus Boring with a capital B. My kids will half-heartedly give everything a go once or twice, and then they're off to explore the perimeter. 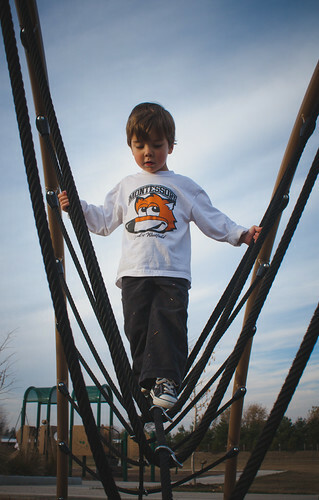 If there's a ravine, a storm drain, or a pile of rocks nearby, they'd much rather mess with that stuff than play on the same playground they've been visiting in some form for their entire lives. There's nothing inherently wrong with this, and after reading Richard Louv's "Last Child in the Woods," I actually encourage it. He bemoans the homogeneity and ultra-safe state of today's playgrounds and notes that most children will naturally gravitate to nature over play areas that neither challenge nor stimulate their senses. Yes, I'm that mom the other moms hate at the playground. The one whose children are stomping in the mud, luring the other kids away from the nice, neat playground. I'd say I'm sorry but I'm not. After we'd been at the playground for 15 minutes or so that first day, Elena tried to navigate the "slide." Here was my extremely agile and adept 8-year-old (she mastered the monkey bars before she was 3 1/2) flummoxed by this slide. She said, "Mom? I think this playground is a little dangerous." I didn't know whether to laugh or cry. I used to build forts in the woods, alone with friends, nearly a quarter mile away from my house. I used to sled down a hill onto a frozen lake. You know, on the kind of ice that might crack? I used to play on that merry-go-round that could hit speeds of 20 miles per hour before it flung you off into the rocks. These things have a hint of danger. Playgrounds of today do not. I know I sound a little bit like the cranky old lady that wants you off her lawn. 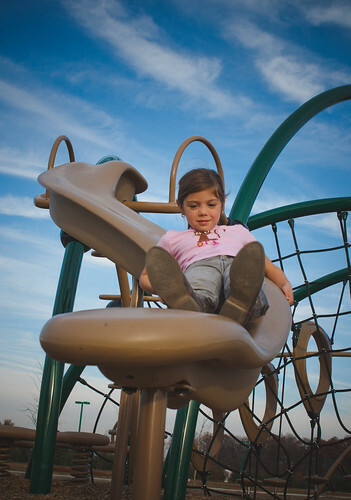 Advances have been made in playground safety, for good reason. I knew a girl that needed her finger reattached after it was nearly severed by a rusty Hamburgler on a crappy McDonald's playground. I really don't want my kids launched off a merry-go-round. But for pete's sake, I'd like them to have a little fun. Elena eventually decided to go for it, and not only did she not hurt herself, she actually had fun. Both kids maneuvered their way around the playset, fell off, tried again, and had to be dragged kicking and screaming back to the car when our time was up. Call it The Dangerous Park if you like. We'll call it A Blast. And apparently your the also the mom who doesn’t make your kids wear jackets or coats. Ha! Just kidding. That looks so cool. I’ve never heard of it, but what a great concept. Well, that too. In my defense, I took those pictures in early November before it got cold. But I totally got scolded by an older gentlemen yesterday because Elena wasn't wearing a coat (and it was 30 degrees out). I was like, "Dude, she's 8. I'm not fighting that battle." How cool! I hadn’t heard of this and definitely want to take my daughter there… might need to wait a bit before letting my daredevil 3 year old at it, though.